Hello friends! Today, so far, is a much better day. Parker did wake up early because his cough was bothering him. I gave him his inhaler and a bottle and was able to get him back to bed. He sounds HORRIFIC but his pediatrician says he's on the road to recovery. We'll probably have to keep treating him with his inhaler for a long time but that's ok.
My card uses my new FAVORITE paper pack, Basic Grey Green at Heart. Basic Grey is after my heart, for real! I love this company and their awesome paper! The stamp and coordinating punch is from Martha Stewart. 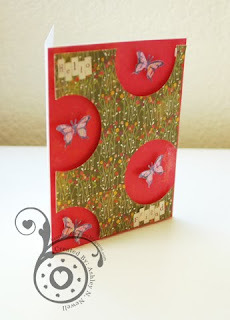 I painted the butterflies with Creative Inspirations Paints in Pink Highlights. It's super pretty! It's a sheer white paint but the glitter sparkles pink. Eeeek! I love it! 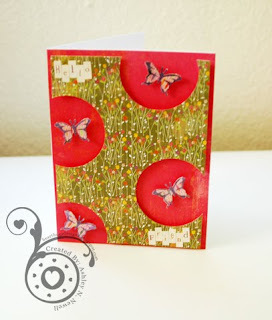 And I finished with the sentiment using Making Memories Tiny Alpha, which I love as of late. Here's another picture I took to try to capture the pretty pink sparkle that the paint gives. Can you see it? It's not in your face, it's more of a subtle shimmer. Alright, off to take the kids to the park! Have a great Thursday friends! Oh, and my 5 year wedding anniversary is tomorrow. :) I guess I should make a card for that too. Whoops! OMGosh! This is one awesome card. I love how you did the circles and the colors are just beautiful. You are so creative my cyber friend. I like what you did with this sketch! I am getting ready to post my card for this sketch too and it took me awhile to decide on what to do with it. Glad to hear Parker is doing a little better! Very pretty girl! I love your idea about the circles! Have fun at the park and Happy Anniversary!!! I love this card- and I just got some of that paper- I love your idea- I would never have been able to come up with such a cool card- great job with the sketch and I love the sparkle! Great job on this card! Hope Parker is feeling better and better and that you can all get a good night's sleep! Happy Anniversary to you and your dh! !